Lukasz Kowalczuk has written and drawn many indie comics in his native Poland and elsewhere as well as creating “I Hate People” for Vice. Łukasz is a Polish comic artist and graphic designer, who makes, as he calls it himself, “stupid comics for smart people”. He has self-published more than 30 titles since 2010. 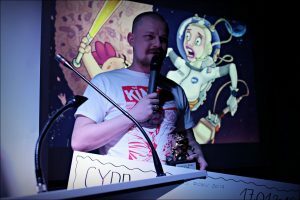 He is the creator of ‘Vreckless Vrestlers’, a mini-series about an interdimensional wrestling tournament, released in Poland in July 2015. He also done ‘Violent Skate Bulldogs’ for the Canadian small press publisher Bloddy Gore Comix, ‘RadioAcvite Cross’ for Aces Weekly, ‘Slime!’ for Rats & Crows, ‘Samurai Slasher: Late Fees’ (written by Mike Garley), ‘Secret Santas’ (Ben Grisanti), ‘Strike Team Codename Diamond Force’ (Michael Tanner) and short stories for zines and anthologies all over the world.